Take your tastebuds on a journey at Ting, a restaurant putting their own twist on Asian cuisine. The crispy rice ($13) is a highlight of the sushi appetizers. Fresh spicy tuna top the fried rice, giving it dimensional texture and flavor. A jalapeño kicked it up a notch, while harmonizing with sweet soy sauce. With an expansive menu covering two kitchens, an order can get dynamic by mixing and matching classic cooked Asian dishes with raw sushi assortments. The B.B.Q. spare ribs ($15) come with a rich honey glaze sauce that brings out the flavor of the tender rib meat. 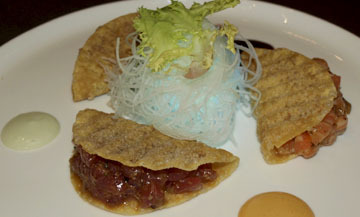 The wonton sushi tacos ($15) show off Ting’s fusion skills by creating a taco from fried wonton, freshly made tuna, salmon and yellowtail tartars. The fish is luxurious and flavorful. Ting’s chefs constantly work to evolve the menu, updating it around twice a year, McGlone said. 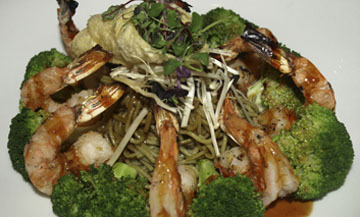 The shrimp and soba ($26) is a new entree that made its way onto the menu after being featured as a special. The green tea soba noodles were light and covered in a sweet soy glaze. Although the grilled shrimp and broccoli lay on the outside of the dish, they are far better once they are mixed in the noodles and sauce. Ting offers vegetable and tofu options for any dish. The vegetable lo mein ($11) is a healthy take on the Chinese classic, filled with scallions, broccoli, asparagus and onions. The comfort of the dish remains. 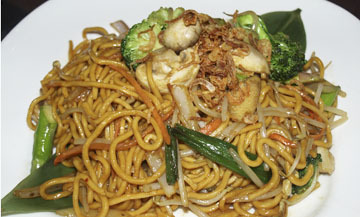 Asian fusion is achieved with diversity in Ting’s kitchen. All of their chefs collaborate on the menu. The teriyaki combo ($27) gives guests a taste of two meats. The generous portion of chicken, steak and vegetables are complemented by the savory teriyaki sauce. Glistening chandeliers and warm colors give Ting’s décor a classic feel. Price range: Appetizers: $4.50-18, Salads: $6-14, Sushi bar entreés: $16-50, Entrées: $15-32. Hours: Monday-Thursday, 11:30 a.m. - 9:30 p.m.; Friday, 11:30 a.m. - 10:30 p.m.; Saturday, 12:30-10:30 p.m.; Sunday, 12:30-9 p.m.